Many homeowners have wide backyards that are underutilized and are bursting with potential. One of the best ways to make full use of these areas is to convert it into an outdoor living area. Exterior remodeling expert DreamMaker Kitchen & Bath – Greater Grand Rapids shares some design inspirations for a beautiful outdoor living area. There are two main benefits to relocating the recreation room to your outdoor space: one, you get a recreation room that isn’t cramped. Two, you can have the basement converted into another bedroom, or perhaps a quiet home office. If you’re worried how a widescreen TV or a gaming system will fare in outdoor conditions, these can be installed in enclosed spaces such as airtight glass enclosures or hideaway furniture. An outdoor pool table or similar centerpiece completes the set. 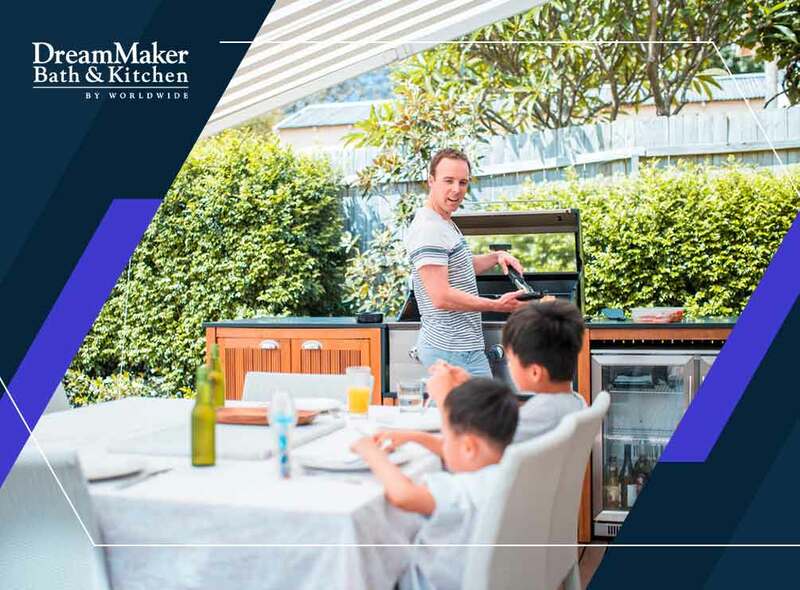 If you like to host summer barbecues and backyard parties for friends and family, an outdoor kitchen would be a great addition to your home. You can pick virtually any design that you can think of, from clean and contemporary, to rough and rustic. As a kitchen remodeling expert, we can help you choose the cooktops, sinks, and storage areas, as well as essential components like gas, electricity, and water. You can have your outdoor dining area designed for virtually any dining situation, from casual to formal. You can choose from a variety of covers, or even none at all, for romantic open-air dinners. Furniture selection is an important part of outdoor dining areas. You’ll want it to be comfortable, durable and able to withstand the weather all year round. Perhaps you want a bar-style dining area that can double as an open-air breakfast nook. As a true design/build firm, DreamMaker Kitchen & Bath – Greater Grand Rapids can help make your outdoor remodeling project from conception to completion. DreamMaker Kitchen & Bath – Greater Grand Rapids is a faith-based organization that provides excellent exterior, kitchen, and bath remodeling through integrity and client-centric customer service. Give us a call at (616) 200-7495 or fill out our contact form. We serve clients in Ada, MI and surrounding areas.